Definition at line 111 of file _heap.c. Referenced by __make_heap(), __partial_sort_copy(), and __pop_heap(). Definition at line 146 of file _heap.c. Definition at line 54 of file _heap.h. Referenced by __partial_sort(), and __pop_heap_aux(). Definition at line 74 of file _heap.h. Definition at line 206 of file _heap.c. 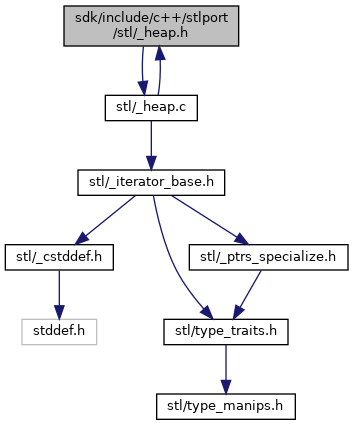 Referenced by __partial_sort(), __partial_sort_copy(), HeapTest::mkheap0(), HeapTest::mkheap1(), HeapTest::pheap1(), HeapTest::pheap2(), and priority_queue< _Tp, _Sequence, _Compare >::priority_queue(). Definition at line 233 of file _heap.c. Definition at line 138 of file _heap.c. Referenced by HeapTest::mkheap0(), HeapTest::mkheap1(), priority_queue< _Tp, _Sequence, _Compare >::pop(), and sort_heap(). Definition at line 181 of file _heap.c. Definition at line 65 of file _heap.c. Referenced by HeapTest::pheap1(), HeapTest::pheap2(), and priority_queue< _Tp, _Sequence, _Compare >::push(). Definition at line 102 of file _heap.c. Definition at line 99 of file _heap.h. Referenced by __partial_sort(), __partial_sort_copy(), HeapTest::pheap1(), and HeapTest::pheap2(). Definition at line 108 of file _heap.h.